Get out your calendar and mark the date down - June 2nd is National Bubba Day! This is the unofficial holiday to honor your family members and friends who are named Bubba. If you don't know someone named Bubba right off hand... well, that's okay too. It's a good excuse for a hootin' and hollerin' redneck celebration. Let's get right down to the details! It's party time, y'all! Now, you'd think that a holiday such as National Bubba Day would have a huge history. But it doesn't. It's not recognized by any city, state or government. No one knows for certain who came up with the idea, although there are a couple of rumors. 1) A couple of Bubbas from Missouri came up with the idea back in the 1860s. 2) Another says that comedian/recording artist T. Bubba Bechtol started it. There have been a number of Bubbas on television and in politics. One you may recognize is Plumber Bubba, from Larry the Cable Guy. Other famous Bubbas include Benjamin Buford "Bubba" Blue (Forrest Gump); Bubba Bexley (Sanford & Son); Bubba Skinner (In the Heat of the Night); and Bubba Bo Bob Brain (Pinky & The Brain). But for all you Bubba-loving folks, it doesn't really matter who coined the idea. It's just another holiday to add to the calendar, giving you an excuse to party. Who - or What - Is a Bubba? Bubba is one of those nicknames we use here in the country to describe our buddies or siblings. Since most people here have two names - Robert Lynn, Glen Dale, James Robert, Roy Bob or John Carl - it's much easier to say "Bubba". After all, we don't want to waste words when there's more important things going on! I happen to have a good friend who goes by "Bubba". His real name is Lloyd Eugene, which is quite a mouthful! As long as I've known him, which is almost 30 years, he's gone by the name of Bubba. He's a good ol' boy, so he definitely fits the ticket! When June 2nd rolls around, be sure to have all the proper ingredients to show your love for Bubba! Keep in mind that he's just a good ol' boy, so he'll be pleased with just about everything you do. Location - It's best to celebrate National Bubba Day out in the yard, as it will be more comfortable for your guests. Plus, you won't have to worry about beer spills on your carpet. Parking - Make certain you have plenty of parking spaces. Bubba drives both a big pickup truck and a tractor, and he needs a lot of space to maneuver. It's best to rope off a parking area to keep party guests off of your lawn. Decorations - There are a number of ways you can decorate. 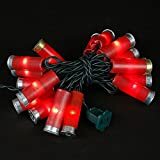 I happen to like the strings of shotgun shell lights to add to the party mood. You might prefer the chili pepper ones. It's also great to have some bar signs or mirrors hanging up around the place, so Bubba will feel right at home. Party Clothes- Make certain you wear your party best. Dress better than what you'd wear to Wal-mart, but not as good as you wear to the Dollar store. Something that you feel comfortable in, and doesn't have too many holes, works the best. Overalls are a good choice for men, while women might wish to wear spandex or halter tops. Tip: the less you wear, the more your tattoos will show! An outdoor party needs lights after the sun goes down, and these shotgun shell party lights will do the job! They were fired before being made into lights, and Bubba will appreciate you care enough to decorate with the real McCoy! A few cases of good beer, or a pony keg or two. Don't buy the every day, cheap stuff you normally drink. Go all out for a change! If you usually buy light beer, go for the full flavor. And purchase a brand name beer for Bubba.. he'll appreciate the thought. Serve only the good stuff! Tip: Save the beer cans for target practice. Fill them with water, as they will blow up when struck. What is a party without food? For National Bubba Day, treat him with the most tender calf fries you can find. If they aren't available at your local store, I imagine one of the neighbors can cut 'em for you fresh! Throw in some fried potatoes, and some okra off the vine, and you're all set! It also doesn't hurt to have some lemons and limes. Bubba may want to spice up his beer for the occasion. If you need recipes for other items to cook on the grill, try corn on the cob or grilled onions. They are a sure-fire way to spice things up at your barbecue! Have a really great selection of music playing on your stereo. The best music is by artists such as Merle Haggard, Bob Wills, or Hank Williams. Put away your hard rock and rap music, as Bubba isn't too fond of the noise. Bubba will need to be entertained at the celebration, so make certain you have games on hand. Horseshoes is a favorite game to played on National Bubba Day. Other favorites include dominoes, spitting contests, cow chip throws, and target shooting. The final step to throwing a successful Bubba party is to give out gifts or party favors to your guests. Beer coozies are inexpensive, and can be customized with your favorite photo or saying. Other options include match books, pocket knives, ball caps, fishing lures and key chains. You don't have to spend a lot of money to let Bubba know you care! One Final Tip For A Successful Celebration - Don't Drink & Drive! 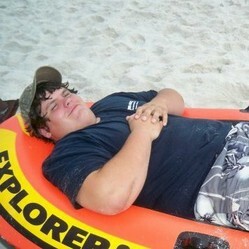 If Bubba or his buddies have too much to drink, just load him in the tractor bucket, and give him a ride home. He'll thank you later! Do you have any suggestions for music, entertainment or party favors for National Bubba Day? My mother is from the South and my father was from Oklahoma, so as you can guess, there are some Bubbas in my family. I love it. I lived in the south for a lot of years. Everyone called everyone Bubba it seemed. Fun article. What a fun article, and how nice to see you here! Calf fries, also known as "Rocky mountain oysters" are such a delicacy that Bubba would be proud to have them served in his honor! In actuality, they are the bull testicles that are saved after the rancher castrates his bull. Just clean 'em up a bit, fry them up, and you'll enjoy a chewy dish along with your other party vittles! You might want to explain what calf fries are. I never heard of filling cans with water before using them for target practive - I bet it's a great visual effect. I don't think I'd want to hold a party with lots of beer with Bubbas carrying weapons. There's always a good reason to celebrate and I've never celebrated Bubba Day.